Neoprene was invented by DuPont® in 1930, and neoprene wetsuits, shoes, gloves, and hoods have been keeping boaters warm for years. The manufacturing process for neoprene used in these garments makes millions of tiny gas bubbles in the material that interfere with the transfer of heat through it. 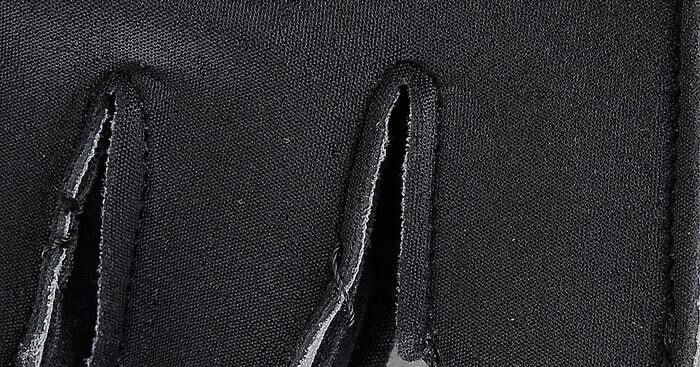 By itself, this neoprene isn't very rugged, so usually woven fabrics are glued over it for protection. Wetsuits and other neoprene boating apparel work best by fitting snugly, thus minimizing the amount of water that can get inside the garment. And you don't want water being exchanged in and out because it will be carry body heat with it. This is the simplest type of stitch and is typically only found on thin neoprene gloves. It isn't waterproof, and it makes a bulge on the inside of the garment. 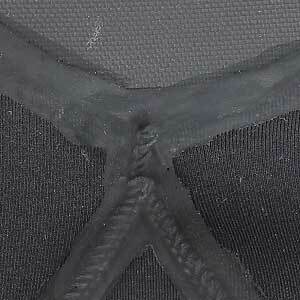 Garments have to be designed to avoid this stitch in pressure-point areas. 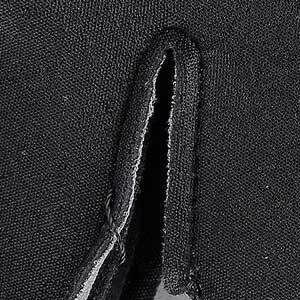 Single-needle stitch, the simplest one used on our neoprene garments. 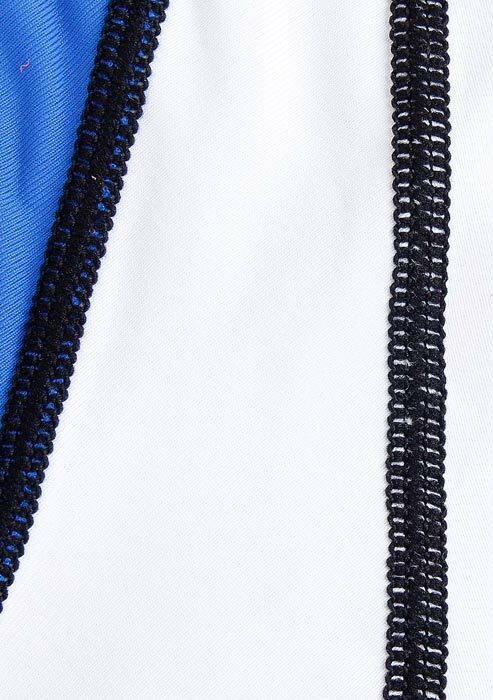 In this stitch, the edges of the neoprene are butted or overlapped together, and two or four needles punch all the way through the material to make a flat, interlocking thread pattern that is very strong and comfortable against the skin. The many holes created do allow considerable water penetration. The "mauser" stitch used on some garments is a type of flat-lock stitch. Flat-lock stitch, showing tape (green) covering the stitch to waterproof it. Here, the edges of the material are first glued together. Then a special sewing machine with a curved needle stitches the seam, with the needle only penetrating the face fabric on one side of the material. This very strong, watertight seam is more expensive and is found on top-quality items. 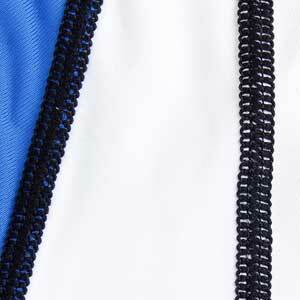 3 mm thick neoprene is the practical minimum material thickness for this stitch. Glued blind-stitch, glue joint shown in red. Any stitch type can be waterproofed by taping over the seams. The two types of taping are fabric tape and the new, innovative LiquidSeam™ seal. Products like Rogue Gloves Expedition Socks, Boundary Socks, Sandal Socks and Farmer Bill Wetsuits use use fabric tape, and Maverick Gloves are LiquidSeam sealed. Neoprene garments are an important part of boaters' comfort and safety systems. 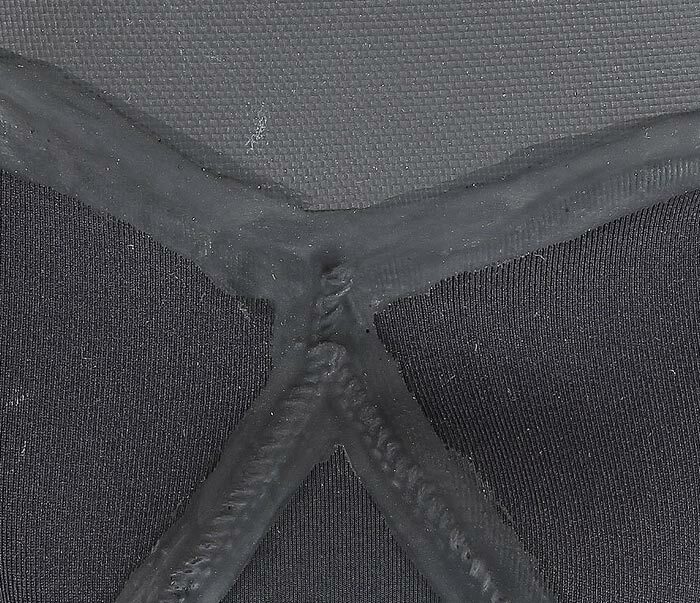 And NRS works hard to keep innovating new technologies and improving neoprene performance.